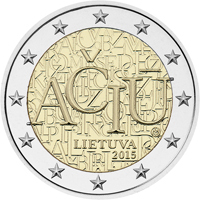 On Monday, 14 December, the Bank of Lithuania issued into circulation the first Lithuanian 2 euro commemorative coin, which is dedicated to the Lithuanian language. These Lithuanian coins, the mintage of which is one million, may be used for payments not only in Lithuania, but also in other countries using the euro. The launch of the new coin took place at the Writers Hall at the Faculty of Philology of Vilnius University. ‘With the first Lithuanian commemorative coin, we spread the word about our remarkable language — it is believed to be the most archaic living Indo-European language. The coin bears the word AČIŪ (‘Thank you’). This is one of the first words that children and foreigners learn; it is often used in our daily life. The word also reflects the Lithuanian language and is beautifully linked to the theme of money. After all, each payment for goods or services, in a sense, is a materialised way of expressing gratitude,’ said Vitas Vasiliauskas, Chairman of the Board of the Bank of Lithuania. 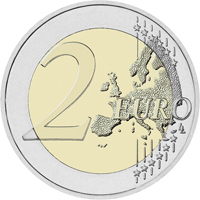 The commemorative 2 euro coins dedicated to the Lithuanian language were minted at the UAB Lithuanian Mint. The mintage of the coin is 1 million, including 10 thousand of a higher (BU) quality in a numismatic package. Designers of the national side of the coin were Liudas Parulskis and Giedrius Paulauskis. At its Cash Offices, the Bank of Lithuania offers for sale coins in a numismatic package (the price per package is €9). The remaining mintage is issued to banks as normal circulation currency; it will not be possible to obtain coins at the Bank’s Cash Offices at their nominal value. Bulgarian National bank issued new bimetallic coin "Paisius of Hilendar" in denomination of 2 levs. The obverse of the coin features in the centre of the inner circle the nominal value indicated by the figure ‘2’ furrowed by lines. On the periphery there is a graphical pattern of crossing lines both on the inner circle and the outer ring. The lower side of the coin features the inscription ‘ЛЕВA’ (levs) with the letters starting from the outer ring and crossing into the inner circle. The year of issue ‘2015’ is on the outer ring to the right of the wording ‘ЛЕВA’. The reverse of the coin features on the inner circle the stylized image of Paisius of Hilendar and the years ‘1722 – 1773’, and on the outer ring the inscriptions ‘ПАИСИЙ ХИЛЕНДАРСКИ’ (Paisius of Hilendar) and ‘БЪЛГАРИЯ’ (Bulgaria). 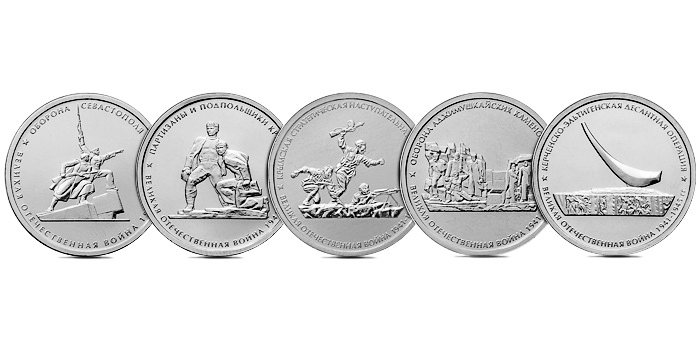 Base metals: In denomination of 10 Roubles – “Khabarovsk” of the series “Towns of Martial Glory”. A silver proof coin in denomination of 3 Roubles (fine metal content 31.1 g, fineness 925/1000, diameter 39.0 mm, mintage 3000 pcs) and a gold proof coin in denomination of 100 Roubles (fine metal content 15.55 g, fineness 999/1000, diameter 30.0 mm, mintage 500 pcs) have the rim raised on both sides of the coins along the circumference. The edge of the coins is corrugated. 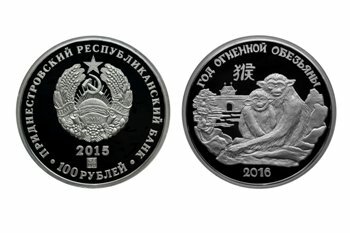 The obverse side of the coins has a relief image of the State Coat of Arms of the Russian Federation. 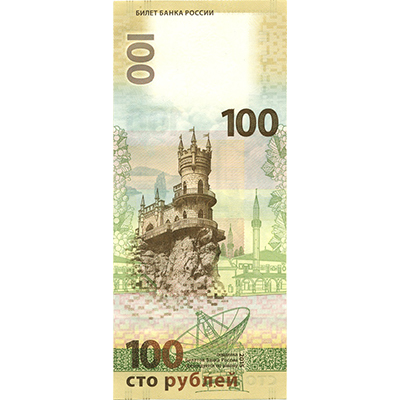 There are inscriptions: “РОССИЙСКАЯ ФЕДЕРАЦИЯ” (RUSSIAN FEDERATION), the denomination of the coins “ТРИ РУБЛЯ” (THREE ROUBLES), “СТО РУБЛЕЙ” (ONE HUNDRED ROUBLES) respectively and the year - “2015”, an indication of the metal according to the D.I. Mendeleyev Periodic System of Elements, purity, trade mark of the Saint Petersburg mint and fine precious metal content. of the gold proof coin in denomination of 100 Roubles depicts a relief image of an emblem of the Eurasian Economic Union. There is an inscription along the circumference: “ЕВРАЗИЙСКИЙ ЭКОНОНОМИЧЕСКИЙ СОЮЗ” (EURASIAN ECONOMIC UNION). A coin in denomination of 10 Roubles is 22.0 mm in diameter, yellow in colour and has the rim raised on both sides of the coin along the circumference. The edge of the coin is corrugated, each section contains different number of corrugations alternating with smooth sections. The obverse side of the coin has inscriptions along the circumference: “БАНК РОССИИ” (BANK OF RUSSIA) on top, “2015” at the bottom. On the left and on the right there are stylized images of laurel and oak branches respectively. 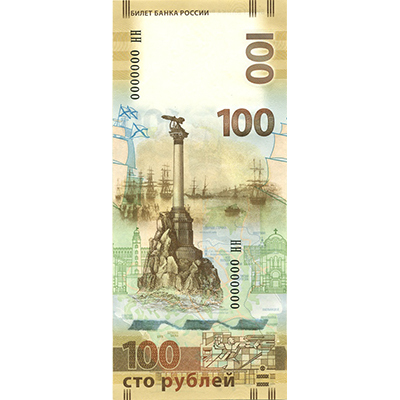 In the center of the disc there is an indication of the face value of the coin “10 РУБЛЕЙ” (10 ROUBLES) in two lines. Inside the figure “0” there is a protective element in the form of the figure “10” and an inscription “РУБ” (RUB) visible when changing angles of vision. In the lower part of the disc there is a trademark of a mint. The mintage of the coin is 10000000 pcs. The coins are legal tender of the Russian Federation. They are obligatory for acceptance for all kinds of payments without any restrictions at their face value.